LED Star « Adafruit Industries – Makers, hackers, artists, designers and engineers! Just in time I finished a LED Christmas decoration using Neopixels and an ESP8266. It’s made of reclaimed wood and aluminium with an fairground light as Neopixel housing. Maybe a nice project for other makers as a Christmas gift. 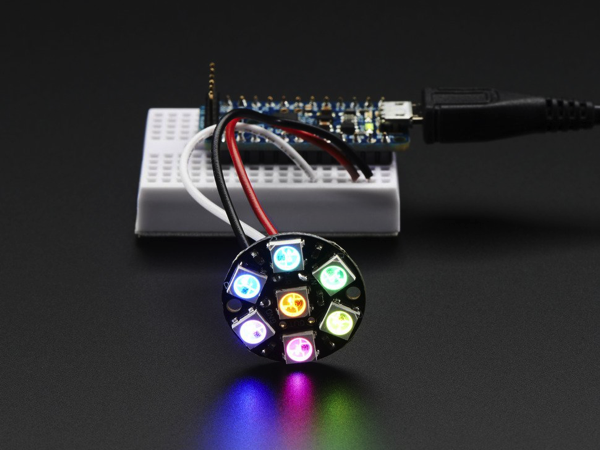 NeoPixel Jewel – 7 x 5050 RGB LED with Integrated Drivers: Be the belle of the ball with the NeoPixel Jewel! We fit seven of our tiny 5050 (5mm x 5mm) smart RGB LEDs onto a beautiful, round PCB with mounting holes and a chainable design to create what we think is our most elegant (and evening-wear appropriate) NeoPixel board yet.